• there are cuts or punctures in the tire larger than those mentioned above. • the wheel rim is damaged. • you have driven at very low tire pressures or on a flat tire. Do not drive any further. Contact a qualified specialist workshop. The tire sealant is harmful and causes irritation. It must not come into contact with your skin, eyes or clothing or be swallowed. Do not inhale TIREFIT fumes. Keep tire sealant away from children. There is a risk of injury. • Rinse off the tire sealant from your skin immediately with water. • If the tire sealant comes into contact with your eyes, immediately rinse them thoroughly with clean water. • If tire sealant is swallowed, immediately rinse your mouth out thoroughly and drink plenty of water. Do not induce vomiting, and seek medical attention immediately. • Immediately change out of clothing which has come into contact with tire sealant. • If an allergic reaction occurs, seek medical attention immediately. Do not operate the tire inflation compressor for longer than eight minutes at a time without a break. It may otherwise overheat. The tire inflation compressor can be operated again once it has cooled down. TIREFIT is a tire sealant. ■ Do not remove any foreign objects which have penetrated the tire, e.g. screws or nails. ■ Remove the tire sealant bottle, the accompanying TIREFIT sticker and the tire inflation compressor from the stowage well underneath the cargo compartment floor . ■ Affix part : of the TIREFIT sticker within the driver's field of vision. ■ Affix part ; of the TIREFIT sticker near the valve on the wheel with the defective tire. 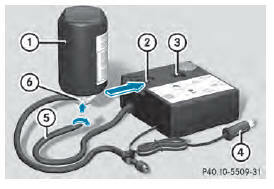 ■ Pull plug 4 with the cable and hose 5 out of the housing. ■ Screw hose 5 onto flange 6 of tire sealant bottle 1. ■ Place tire sealant bottle 1 head downwards into recess 2 of the tire inflation compressor. ■ Remove the cap from valve 7 on the faulty tire. ■ Screw filler hose 8 onto valve 7. ■ Insert connector 4 into a 12 V socket in your vehicle. Observe the notes on sockets . ■ Turn the SmartKey to position 1 in the ignition lock . ■ Press on/off switch 3 on the tire inflation compressor to I. The tire inflation compressor is switched on. The tire is inflated. First, tire sealant is pumped into the tire. The pressure can briefly rise to approximately 500 kPa (5 bar/73 psi). Do not switch off the tire inflation compressor during this phase. ■ Allow the tire inflation compressor to run for five minutes. The tire should then have attained a pressure of at least 180 kPa (1.8 bar/26 psi). If a tire pressure of 180 kPa (1.8 bar/26 psi) has been attained after five minutes: . If a tire pressure of 180 kPa (1.8 bar/26 psi) has not been attained after five minutes: . If tire sealant leaks out, allow it to dry. It can then be removed like a layer of film. If your clothes are soiled with tire sealant, have them cleaned with perchloroethylene at a dry cleaner as soon as possible. If a pressure of 180 kPa (1.8 bar/26 psi) has not been achieved after five minutes: ■ Switch off the tire inflation compressor. ■ Unscrew the filler hose from the valve of the faulty tire. ■ Very slowly drive forwards or reverse approximately 30 ft (10 m). ■ Pump up the tire again. After a maximum of five minutes the tire pressure must be at least 180 kPa (1.8 bar/ 26 psi). If the required tire pressure is not reached after the specified time, the tire is too badly damaged. The tire sealant cannot repair the tire in this instance. Damaged tires and a tire pressure that is too low can significantly impair the vehicle's braking and driving characteristics. There is a risk of accident. Do not continue driving. Contact a qualified specialist workshop. A tire temporarily sealed with tire sealant impairs the driving characteristics and is not suitable for higher speeds. There is a risk of accident. You should therefore adapt your driving style accordingly and drive carefully. Do not exceed the specified maximum speed with a tire that has been repaired using tire sealant. Residue from the tire sealant may come out of the filler hose after use. This could cause stains. Therefore, place the filler hose in the plastic bag which contained the TIREFIT kit. Have the used tire sealant bottle disposed of professionally, e.g. at a qualified specialist workshop. If a tire pressure of 180 kPa (1.8 bar/26 psi) has been attained after five minutes: ■ Switch off the tire inflation compressor. ■ Stow the tire sealant bottle and the tire inflation compressor. The maximum speed for a tire sealed with tire sealant is 50 mph (80 km/h). The upper part of the TIREFIT sticker must be affixed to the instrument cluster in the driver's field of vision. ■ Stop after driving for approximately ten minutes and check the tire pressure with the tire inflation compressor. The tire pressure must now be at least 130 kPa (1.3 bar/19 psi). If the required tire pressure is not reached after driving for a short period, the tire is too badly damaged. The tire sealant cannot repair the tire in this instance. Damaged tires and a tire pressure that is too low can significantly impair the vehicle's braking and driving characteristics. There is a risk of accident. ■ Correct the tire pressure if it is still at least 130 kPa (1.3 bar/19 psi) (for the values, see the Tire and Loading Information placard on the B-pillar on the driver's side or tire pressure table on the fuel filler flap). ■ To increase the tire pressure: switch on the tire inflation compressor. 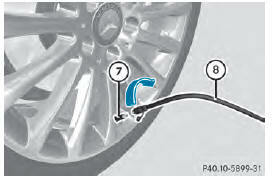 ■ To reduce the tire pressure: press pressure release button E on the filler hose. ■ Drive to the nearest qualified specialist workshop and have the tire changed there. ■ Have the tire sealant bottle replaced as soon as possible at a qualified specialist workshop. ■ Have the tire sealant bottle replaced every four years at a qualified specialist workshop.